It’s so sad that Phyllis Schlafly didn’t get to live to see a woman inaugurated as President of the United States. Apparently there are some right wingnuts in Missouri engaged in a dress rehearsal for the republican National Convention. There’s a struggle of some sort at the Eagle Forum over Donald Trump, or maybe not, or sort of. 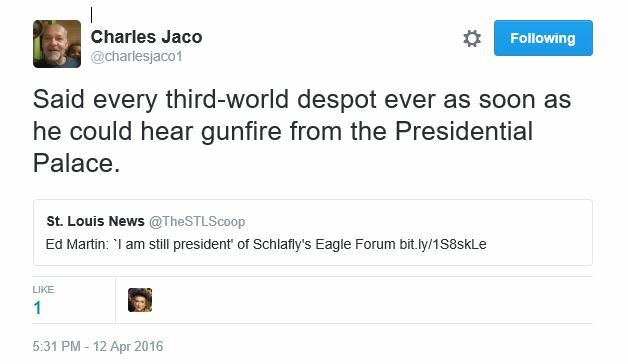 Said every third-world despot ever as soon as he could hear gunfire from the Presidential Palace. There’s some sort of republican commandment writ in stone which they can’t seem to remember. Karl Rove has made himself toxic to Republicans by his incredibly offensive and dangerous statement suggesting the murder of Congressman Todd Akin of Missouri. Any candidate or network who hires Rove will now be tarnished with this most malicious remark ever made in Republican politics…. Senator Claire McCaskill (D) must be living right. Pass the popcorn. The NY Times liberals seek to destroy the American family of the 1950s, as symbolized by Ozzie and Harriet. The TV characters were happy, self-sufficient, autonomous, law-abiding, honorable, patriotic, hard-working, and otherwise embodied qualities that made America great. In other words, the show promoted values that NY Times liberals despise. Instead, the USA is being transformed by immigrants who do not share those values, and who have high rates of illiteracy, illegitimacy, and gang crime, and they will vote Democrat when the Democrats promise them more food stamps. I don’t think that Schlafly wants to imply that the New York Times is directly responsible for those minority births, just that the reporter doesn’t see changing demographics as a catastrophe. Schlafly’s a bit behind the times, though, in her evocation of the TV show Ozzie and Harriet as the zenith of American culture. As I remember it was an especially lame bit of fluff that was mostly held in affectionate contempt by my generation in the late sixties and seventies. I think that we long ago pretty much rejected the sterile picture of American “family values” projected by the Nelson family – narrow-minded, unthinking conformism – while affirming that the virtues Schlafly attributes to the ineffectual Ozzie are not restricted to members of any particular ethnic group. Anti-Irish racism in Victorian Britain and 19th century United States included the stereotyping of the Irish as alcoholics, and implications that they monopolised certain (usually low-paying) job markets. […] They were often called “white Negroes.” Throughout Britain and the U.S., newspaper illustrations and hand drawings depicted a prehistoric “ape-like image” of Irish faces to bolster evolutionary racist claims that the Irish people were an “inferior race” as compared to Anglo-Saxons. Now the Irish are so assimilated that, if they wish, they can fully participate in the same zenophobia that afflicts Schlafly. You will find similar stories about almost every group of immigrants into the U.S. At the beginning of the 20th century, for example, nativists were similarly worked up about Italian and Eastern European immigrants and the cultural changes they were imagined to bring with them. Schlafly’s mean-minded protests are simply more evidence that the process is now repeating itself. But one can’t help thinking that it would be an excellent sign that humans are actually capable of intellectual progress over time if we could manage change this time without the usual displays of nastiness emanating from the dominant tribe as it contemplates losing its privileged status. *“Often immigrant” was added to the last sentence of the 1st paragraph. Will someone please explain to Phyllis Schlafly what "socialism" means? Hell, until Dubya farmed it out to private contractors, the military was socialistic. But (yawn) Phyllis Schlafly expects us to scream in horror at that vile socialist, Barack Hussein Obama. Ed Martin, Bill Hennessey Hide in the Back of Their Own Forum: Schlafly Bolts! FiredUp! has one: This Is What a Better Informed and Better Organized Movement Looks Like. All that is in addition to my first piece, In which I explain who showed up for Ed Martin’s dance; my two videos–so far–of Schlafly: MS. Schlafly takes on “Obamacare” and But, but … I thought Republicans liked police states. ; and a video of Harvey Ferdman, Harvey Ferdman takes the health care reform conversation to common ground. But, but … I thought Republicans liked police states. One of the fascinating paradoxes of the wingoverse is that the law and order, grant no quarter crowd shifts so seamlessly into victimhood when it suits them. “Woe is me. 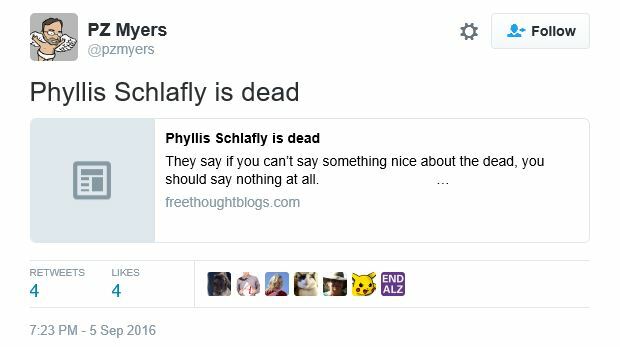 Woe is me,” cries Henny Penny, alias Chicken Little, otherwise known as Phyllis Schlafly. All that is in addition to my first piece, In which I explain who showed up for Ed Martin’s dance. And then there’s my first video of Schlafly: MS. Schlafly take on “Obamacare”. MS. Schlafly takes on "Obamacare"
George Lakoff, in “What Conservatives Really Want”, lays out the right wing worldview more precisely than anyone I’ve read. You should read it. All that is in addition to my first piece, In which I explain who showed up for Ed Martin’s dance. And then there’s the piece I’m about to post: “But, but … I thought Republicans like police states.” Coming soon. Wednesday evening at Drury Plaza in downtown St. Louis, Ed Martin gave a party aimed at drawing mainstream media. But the media stood him up–as did many of his own people. We didn’t stand him up though. At least seventy health care reform advocates attended his “Obamacare” hearing, outnumbering his own crowd. ACA proponents listened stone faced to Peter Kinder’s disembodied voice from Jeff City describing his heroic lawsuit; to Phyllis Schlafly’s tirade about what a vile socialist Obama is; and to Bill Hennessey, insisting that “Obamacare” is unconstitutional–though why, exactly, he didn’t explain. More in later postings about Schlafly and Hennessey. As soon as the Q & A opened, Rea Kleeman was on her feet challenging Ms. Phyllis’s idea that health insurance accounts would be a better solution than the Affordable Care Act. Kleeman, who is an M.D., pointed out that such accounts don’t work because they require a thousand dollars to open one and because many people are too parsimonious to get the preventive care they need, thus opening themselves up to more serious expenses later. Unable to respond to Kleeman’s specific criticism, Schlafly repeated her canned speech and then blamed the fact that the accounts are ineffectual on Teddy Kennedy. Rea was just the opening salvo, though. Next came a soft spoken woman named Alice Sgroi, who gently blasted Mr. Hennessey out of the water and brought the house down. That brought us to break time. After a ten minute break, audience members were to be given two minutes mic time to express their concerns about health care reform. My understanding of a “hearing” is that the panelists speak, then listen to other testimony and respond. That didn’t happen. Schlafly evaporated; Hennessey and Martin stood in the back of the room for ten or fifteen minutes, often chit chatting; then Hennessey slipped out. After that, Martin murmured asides to the other suits in the back. Okay, so it wasn’t a hearing. But Martin’s people, especially Bob, who was in charge of the mic, get credit where it’s due. They did let the left wingers speak. Frankly, I was shocked, because it is uncharacteristic of right wing politicians, in my experience. Left wingers let it rip. I attended those McCaskill town halls in the summer of 2009 where she was subjected to heckling and screaming from angry mobs. In Jefferson County, despite the coarse uproar from those yahoos, Claire put all the questions from the audience into a fishbowl and put two right wingers in charge of picking questions out of the bowl. Contariwise, the only town hall Todd Akin ever was foolish enough to announce so that I could attend it, his media person tried valiantly to talk me out of coming. But I went, and what I filmed that day was totally scripted. Akin and Luetkemeyer took only the “questions” that fitted their agenda. When one gentlemen in the audience, tired of having no chance to speak, challenged a baldfaced lie, that man was escorted from the room. So, Ed and Bob. You took me off guard. You said both sides could speak and … you actually allowed it. Bob handled the mic with fairness and good humor. The hard part for me, then, is picking and choosing who, of the many that spoke, I’ll include here. More left wingers spoke since there were more of them in the audience. I’m going to offer you a selection. Choose the ones that pique your interest, but I especially recommend the one about death panels–and be sure you see at least the first five seconds of “Generally confused”. Oh, and you might want to check out the last video, where Martin reveals that he doesn’t understand the term “socialized medicine”. A Martin supporter contends that death panels are rampant in countries with socialistic medicine. LaDonna Appelbaum describes how health insurance companies made it virtually impossible for her to get health coverage for pregnancies. A Martin supporter, after scornfully dismissing “these people”, seems confused about what she’s trying to prove–not to mention being hardhearted. Judith Parker describes the worry her family endures over the possibility that her four year old granddaughter, who has cancer, would–were it not for health care reform–meet her lifetime caps very soon. The clip begins with a previous speaker talking about what “insurance” means and includes Parker’s response to that. Fritzi Lainoff praises Medicare and, by extension, the idea of involving the government in our health care. A right winger objects to something Lainoff said and an interesting compromise ensues. This young man sees the big picture. This woman is angry that illegal immigrants get care that she has to pay for. Bunnie Gronborg refutes the right wing canard that we’re getting socialized medicine. And she explains the billions that ACA will save the government. Ed Martin disagrees with Gronborg. She tried to explain what “socialized medicine” means. Honest to god, he doesn’t seem to get the concept. Furthermore, he continues disputing the Congressional Budget Office’s prediction that ACA will save the government $143 billion over ten years.